Monday, June 5, 1911: Mother, Besse and Ruthie flew around today a baking pies and cakes. I thought it be fun to swipe one, but oh, the result. Grandma’s married sister Besse came to help her mother and sister bake pies and cakes. It sounds like Grandma didn’t help—I wonder why. As a 16-year-old, you’d think that she’d be a competent baker (or at least could help with some of the easier tasks). But instead Grandma apparently was clowning around—and swiped a pie—and got into trouble. Whew, what punishment was referred to as “the result”? Heat oven to 425 degrees. Beat eggs slightly. Add flour, nutmeg, sugar, and salt; Beat for 1 minute. Add milk and beat until blended. Stir in rhubarb. Bake at 425 degrees for 5 minutes. Reduce heat to 325 degrees. Bake (1 – 1 1/2 hours*) until knife inserted into center pie comes out clean. *This pie takes a long time to bake. If the rhubarb starts to turn brown (burn) before the center of the pie is solid, reduce heat to 300 degrees. Any pie pastry recipe—or a pie pastry purchased at the store— can be used to make Rhubarb Sponge Pie. But for a really flakey crust with an absolutely awesome taste, make an old-fashioned pie shell using lard. Put flour into bowl. Cut in shortening using two knives or a pastry blender. Add water and mix using a fork until dough starts to cling together. If needed, add additional water. 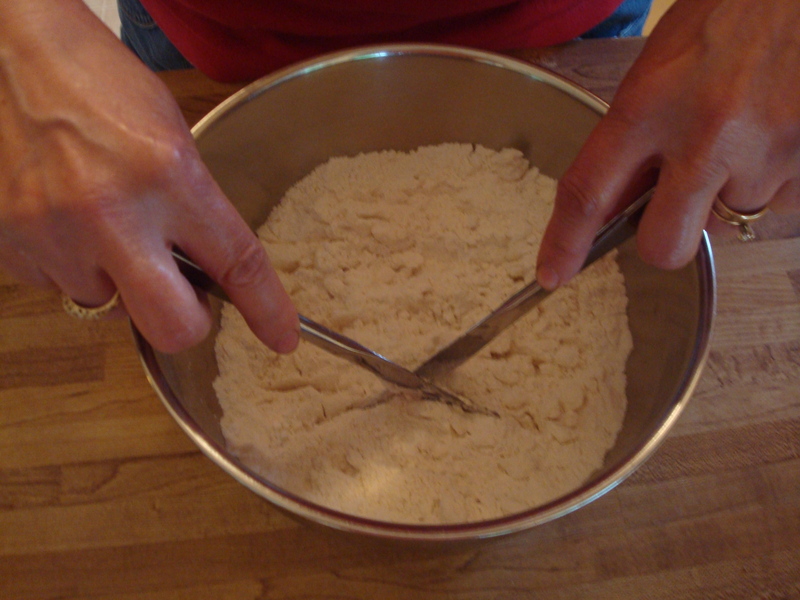 With a little practice it’s easy to cut lard (or shortening) into the flour using two knives. I learned how to do it when I was young and have never felt a need to buy a pastry blender. Gather dough together in a ball. Flatten into a round circle on lightly floured surface (a floured pastry cloth works well). Roll dough 2 inches larger than needed to fit pie pan using floured rolling pin. Fold pastry into quarters; unfold and fit into pan. Trim edge of pastry 1/2 inch from rim of pan. 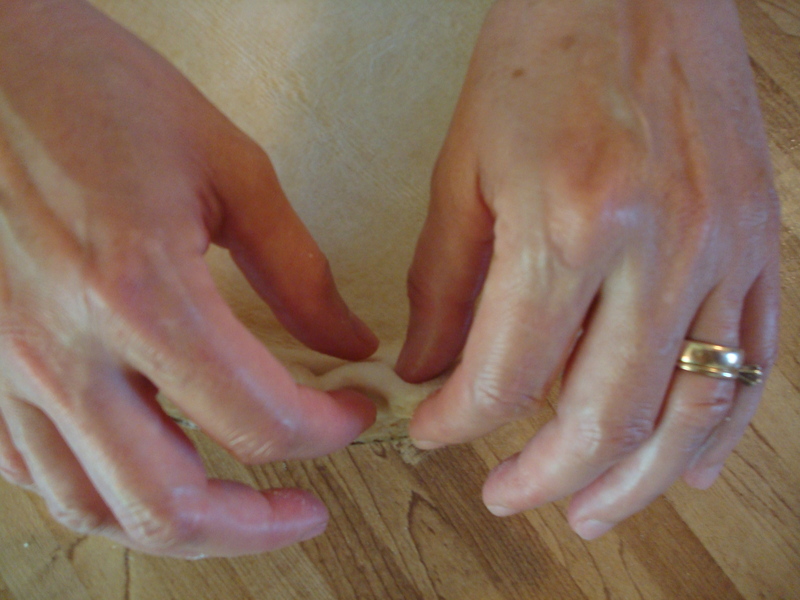 Flute pastry to create edge by pressing between fingers that are moving in opposite directions. 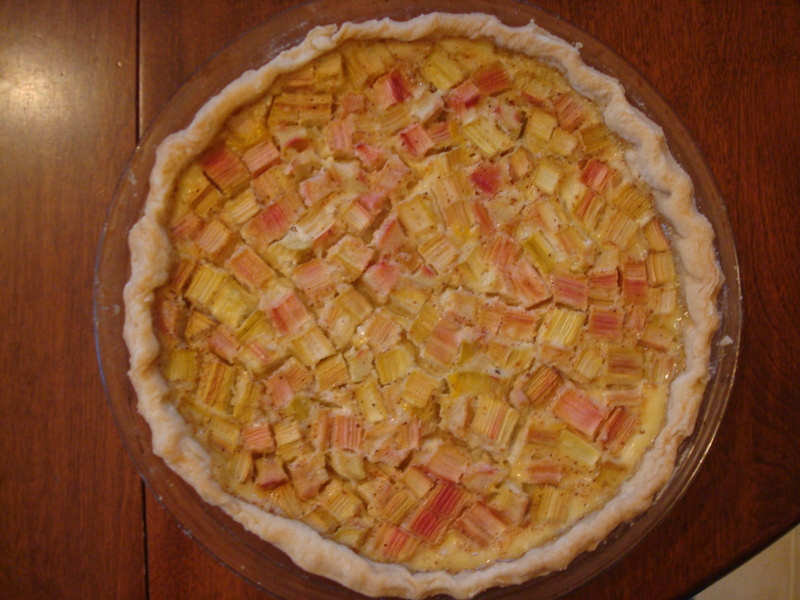 Posted on June 5, 2011 September 19, 2015 by SherylPosted in Food, recipesTagged pie, rhubarb. It does make the best crusts! I can’t figure out why it is almost impossible to find these days. Hopefully now that there is more of a realization that it’s better than some of the substitutes, it will become more available. Well, the problem is there are still a lot of people who are convinced it’s bad for you. Sometimes I wish people would stop fooling around with our natural food.